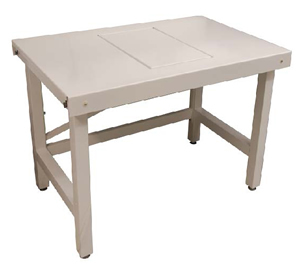 Standard table has a white powder epoxy table top surface incorporating a AMT- 30x40 granite platform featuring four sorbothane isolators. It improves balance performance and is ideal for balances up to 4 to 5 digit. 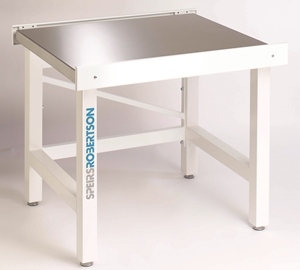 The smooth seamless table shape ensures thorough and easy cleaning removing risks such as cross contamination. 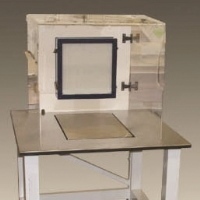 The stainless steel versions feature 240 satin silicon steel with a very low Ra of 0.4 making them ideal for cleanrooms and as well as being resistant to almost all forms of biological and chemical attack.The frame is produced using tubular ERW steel which combines high rigidity with a closed profile that allows easy and thorough cleaning. Tilting leveling feet ensure it sits perfectly in contact with the floor. This Stainless version features an AMS-30x45 platform with four 7Hz sorbothane isolators which give an excellent 95 percent isolation at 50Hz. A unique sound deadening core soaks up surface borne vibrations and ensures our tables outerperform simple granite and steel tables by up to 20dB. 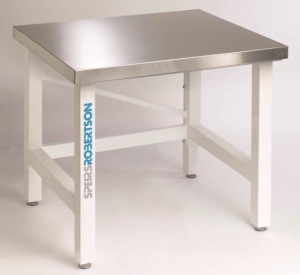 240 silicon satin stainless ensures our tables meet all the requirements for use in stringent Steel Case environments such as cleanrooms and biohazard areas. 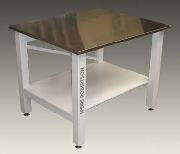 This stainless air table features our AMB-30x45 pneumatic platform. It incorporates four low 2Hz natural frequency rolling diaphragm damped isolators and the platform and table top feature 240 ground satin stainless steel. 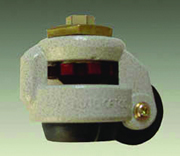 The isolators are simply inflated via adjustable valves using a bicycle pump. 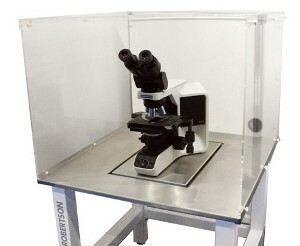 These isolation tables support most of the larger microscopes and their support equipment. The air isolation platform effectively removes most vibrations. The rigid frame has levelling feet which ensure the table is in excellent contact with the floor. The damped rolling diaphragm isolators have a low natural frequency of 2Hz which effectively isolates out vibrations above 6Hz, well below the frequencies at which typical building vibrations begin to occur. Options include: monitor arms, castors, frame and platform shelves and silent air compressors. 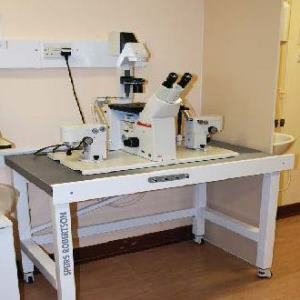 These workstations are designed for heavy instruments such as electron microscopes, cryostats, hardness testers, profilers, interferometers, spectrometers among many others. They comprise a highly rigid platform supported on a very strong frame with built in ultra low frequency 1Hz active damped self-levelling air isolators. The platform features a seamless construction in stainless steel, which makes it both highly durable and easy to clean. It is suitable for biohazard areas and clean rooms. This low cost isolator has a very small footprint and is designed for incorporation into instruments. It is used in conjunction with a damping chamber, which has the advantage of being placable at some distance from the isolator, as required by the user. 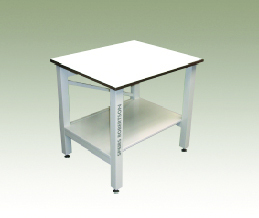 These laboratory tables feature a rigid frame with levelling feet which ensure the table is in excellent contact with the floor. Available with White Epoxy, Stainless Steel or Trespa top. Options include : monitor arms and castor feet. Remove the airborne vibrations that limit the performance of sensitive instruments. A unique construction using interlocking acrylic panels gives complete visibility during work operations. Front panel with portholes for hand access, lifts off to allow easy cleaning of acrylic panels and stainless worktops. Provide a safe environment for working with hazardous substances. A variable speed fan draws air though a HEPA filter, safely removing hazardous materials. Smooth acrylic and stainless surfaces can be thoroughly cleaned. The hinged hood tilts back to allow cleaning of the stainless base and the sides of the hood. Frames bolt directly to the platforms and are feature a hard grey epoxy powder finish. They are supplied with four levelling feet, giving 3cm of adjustment to ensure the frames stability on the most uneven floors. Frame height 71cm, going to a working height of 78cm. A 30cm wide shelf, which sits on the guard rail over the platform and is quick and easy to remove and replace. Supports monitors weighing up to 30kg. 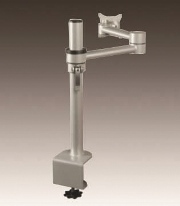 It features 360 degree rotation of the arm as well as height adjustment. It mounts to the platform guard. Attaches to the base of the platform and is pulled out as required. 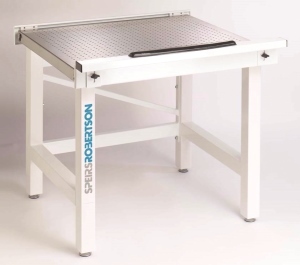 It measures 50x35cm (WxD) and will accommodate most keyboards. These compact and oil free air compressors are virtually silent (30dB/A) versions and suitable for running several platforms. An air preparation unit should be used if compressed air is used which may be damp or contain small particles. The unit will ensure the air supply is properly cleaned and dry before entering the platforms.